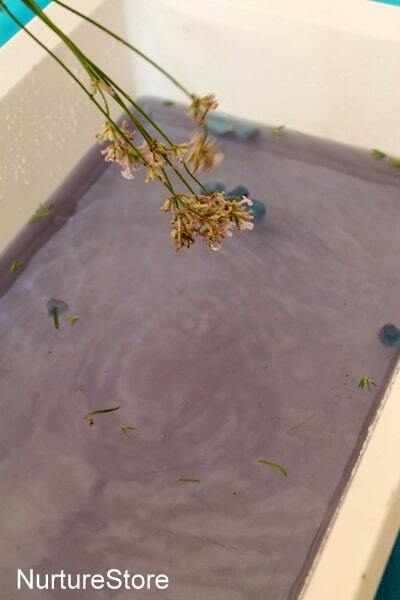 This soothing lavender sensory tub is just the thing for a hot summer’s day, or just before bedtime. 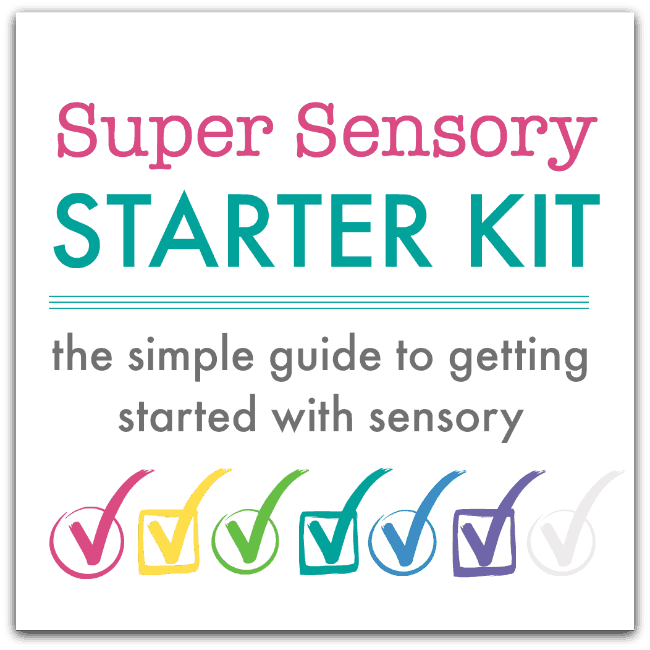 >>> Download my guide to super sensory invitations to play here! Lavender is one of my favourite herbs and fragrances to use with children, as it is so refreshing and calming. 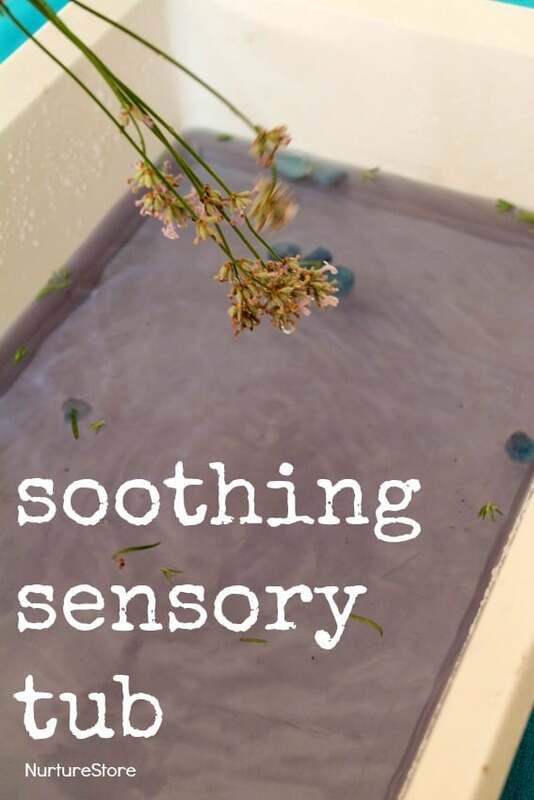 On a hot summer’s day, or in the bathtub before going to bed, this sensory tub is great for play – gently soothing and a lovely sensory experience. It’s great for all ages, from babies to grandparents! And very easy to put together. We used a plastic tub full of cool water as the base of our sensory tub, but you can do this in a paddling pool, in the sink or in the bathtub. 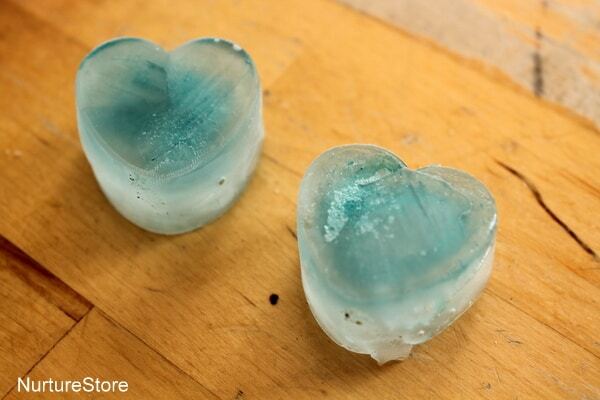 I’d prepared some ice, using water with some purple food colouring in, and had them ready in the freezer. And while I was filling the tub, my daughter went out into the garden to pick some lavender. If you don’t have any fresh, dried lavender is just as good. 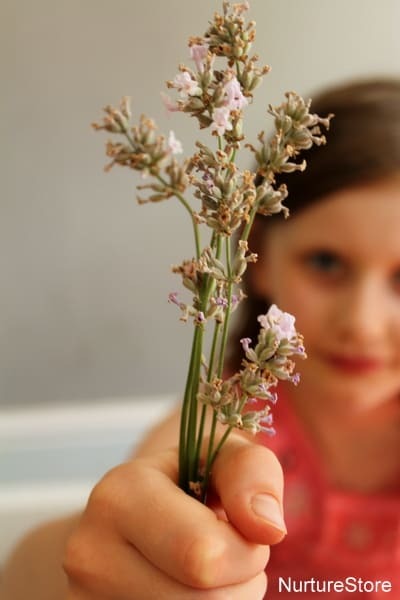 And it’s a great idea to keep a stash of lavender all year round to use in sensory play – you can find some more ways to use it at the end of this article. 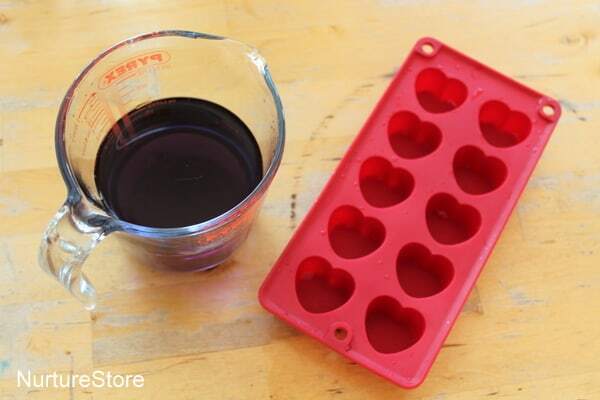 Combine the water, ice and lavender and you’re ready to play. The lavender stalks are great for swooshing in the water to make patterns, and the more you play, the more the fragrance is released. Depending on what your child likes, you could add a teapot and cups for a tea party, some dolls to go for a swim, or some ladles, pots and jugs for scooping and pouring. Or step right in for a paddle to cool hot summer toes!